Here are some shadblow (Amelanchier canadensis) or serviceberry leaves that I collected from my yard this past Fall. Their tattered appearance speaks of the heavy use that the local ecology has made of them. Not only did they provide sugars for the mother shadbush, but insects and perhaps other arthropods (such as mites or spiders) have used them for food and habitat. 1. 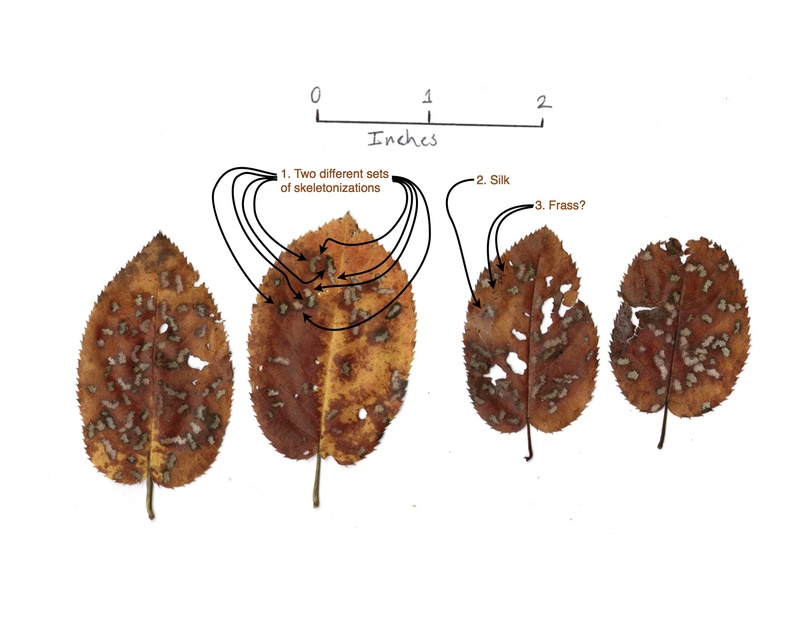 Each leaf is spotted with many skeletonized areas. There appear to be two sets of skeletonizations. One set has light-colored edges, the other has dark-colored edges. Anyone have an explanation? 2. There’s a tiny web of silk on one of the leaves. Who made it? 3. Stuck in the silk are some small dark objects. Are these frass (insect detritus) from the maker of the silk? I have two learning “disabilities” (“learning differences” is a more politically correct, and more accurate term): dyslexia, and ADHD. Some people have been surprised to learn this. I am among them. I was only diagnosed with these learning differences recently. I think of dyslexia as a different brain architecture than the norm. Dyslexic brains are wired in such a way that distant parts of the brain are well connected at the expense of dense connections locally. This different brain architecture makes for a different profile of strengths and weaknesses from more common brain types. Many tasks that are accomplished by non-dyslexic brains automatically and unconsciously, are only accomplished with conscious effort by the dyslexic brain. Examples of such tasks may be (and this varies individual-to-individual) reading, understanding speech, and performing repetitive physical tasks. On the other hand, dyslexic brains tend to be good with spatial reasoning, seeing connections, recognizing ambiguity, and thinking in narratives. For most people, dyslexia does not mean a complete inability to read. It does usually means a slower process learning to read, and some lifelong level of difficult reading as compared with the norm. What Makes You Think You Have Dyslexia? My list of symptoms is quite long. I’ve decided to write an entirely different post about it on my non-math blog. How Can A Dyslexic Get a PhD in Mathematics? As a dyslexic, I’ve never been good at calculations or recalling rote facts like times tables. Here’s the thing: beyond a certain point in mathematics, it’s not really about calculations. Sure, calculations can help big time in certain mathematical disciplines–Gauss was known for being an amazing lightening calculator–but there are areas of math where it’s possible to stay comfortably far from computation. Spatial reasoning. Dyslexics tend to be good at thinking relationally in three dimensions. This is great for many areas of math. Topology is one of those. My PhD is in topology. Seeing connections. Progress in mathematical research is made by drawing connections between disparate subfields. Dyslexics often have a strength here also. Thinking in narratives. The way to predict how well a child will do in math is by how complicated a story they can tell. See this ScienceNews article. It makes sense: proofs are the bread-and-butter of math. Proofs are really a lot like stories. Dyslexics are usually good narrative thinkers. I really didn’t like math at all up until I hit geometry in ninth grade. That’s when math became much easier for me. It may be confusing that moving into more advanced mathematics actually made math easier for me. The key to remember is that my brain works differently from the brains that school curricula were designed for. Here’s a concrete example of how my brain works differently: concept precedes process. A friend was over for dinner the other night. She said that the part of geometry that made sense to her was finding the areas of regions by breaking them into simpler shapes. She said she could do this because of her experience sewing. See what’s happening there? Sewing is a process. Through doing the process my friend was able to get the concept of computing areas. This is a pretty normal way of learning: do a process by rote procedure, then understand the concept. My brain doesn’t like that kind of learning. I learn in the opposite direction: concept first, then procedure. This is also how my dyslexic daughter, Lucy, learns. Lucy had a hard time learning to count. Because my brain works so similarly to hers, I was able to get at the heart of her counting difficulties. The punchline is that she understood the concept, but had a hard time with the process. I wrote about it in a previous post. Mathematics at the PhD level is not about learning process by rote. In the abstract world of pure mathematics, concept may be all you have. Like I said, geometry class was when math became interesting, and easier for me. Suddenly I was in a world, not of strands of symbols to be processed, but of shape, space, lines, angles, concepts, and narrative-like proofs. Suddenly everything made sense. Most exciting of all in my high school freshman geometry class was the idea of non-Euclidean geometry. We learned about the geometry of the sphere (a sphere is the surface of a ball, in math-speak). I raised my hand in class and said “if two-dimensional spherical geometry is like the surface of a three-dimensional ball, maybe our universe is like the surface of a four-dimensional ball.” The teacher seemed to think that I was getting a bit ahead of myself. Maybe I was, but I was finally swimming in my element. Other geometry students were doing things like memorizing theorems. Memorization made no sense to me. Do you know which way is up by memorization? Do you know that snow is cold by memorization? Geometry, and later calculus, topology, and other math classes just made intuitive sense to me. It’s not that I didn’t have to try. But it felt like what my brain was meant to do. In graduate school for instance, I could sit by the pool while my kids played and let my math problems roll around in my head. My brain naturally attacked them with it’s native strengths of spatial reasoning, finding obscure connections, thinking in narratives, and taking different points of view. Later that evening when my family was asleep, I would have to tease my thoughts out into sentences, mathematical expressions, and other strings of symbols. That’s the reality that I hit at the end of my graduate career. It’s the reality that I live with as a career mathematician. I’m not yet willing to sell my soul. My brain still wants to swim in its native stuff. *I’m stealing this list of strengths from The Dyslexic Advantage by Eide and Eide. 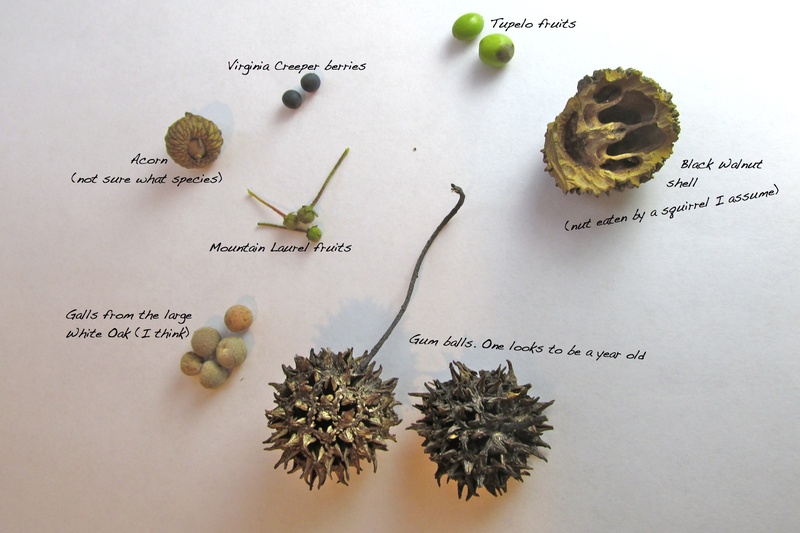 After a brief walk around the back-yard woodlot yesterday, here’s what ended up in my pocket. Here’s something truly amazing that sprouted recently in my backyard. 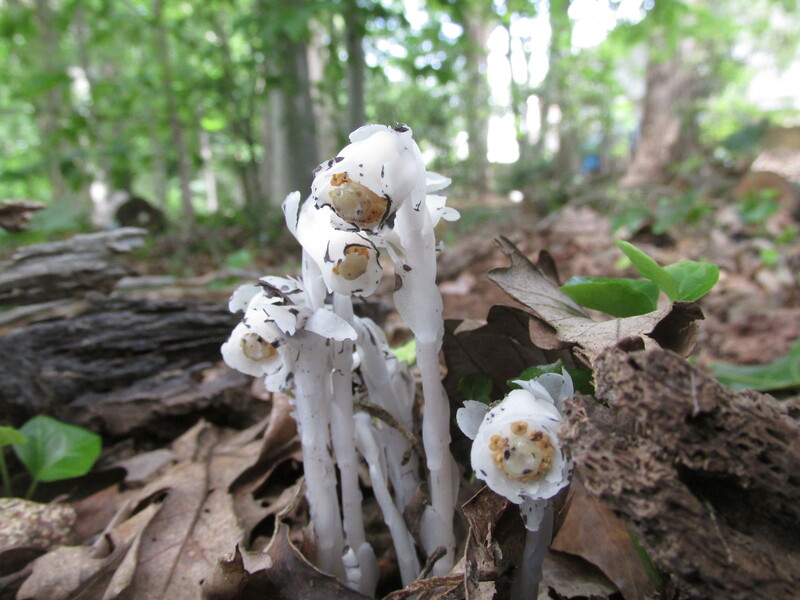 They are plants called Indian pipe, or ghost plant, or corpse plant. The Latin name is Monotropa uniflora. It has no green to it because it has no chlorophyll! No chlorophyll means no photosynthesis. This plant is a parasite. It derives its energy from a fungus which in turn get’s its energy from a tree (probably the American beech in my backyard). Here’s a great little article about M. uniflora. Think about it: an elegant, but ghostly white little flower living out it’s life cycle like so many other flowering plants. It’s pollinated by bees, produces seeds, germinates and grows in the rich forest soil, but it makes it’s living so very differently from other plants. And if you’re looking for your math fix: quantitative parasitology is a thing, yo.